William Cobbett was one of the greatest journalists of his day. Humbly born in Surrey, following a career in the British army in Canada from 1784, he cut his journalistic teeth as the loyalist 'Peter Porcupine' in the United States, defending all things British against the French Revolution and its supporters. Following his return to England in 1800 he became the major critic of corruption and a principal advocate of parliamentary reform and press freedom. It led to prosecution, prison and temporary exile, but also to the eventual triumph of reform and his persistent defence of the rights of the poor. 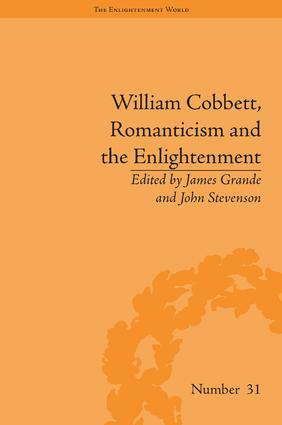 This is the first essay collection devoted to Cobbett and contains essays from scholars from a wide variety of disciplines. It will be of interest to those researching the literature and culture of the late eighteenth and early nineteenth centuries, including the works of Paine, Rousseau, Swift and Hazlitt, and the Chartist movement.